No one truly knows who the first person who had a pet was. Nor do we know when it became a mainstream behavior and a source of joy to millions of people around the world. But what we do know is that for some people, their pets are their entire world, and they would do absolutely anything to make sure they live as comfortably as possible. And over the years, humans experienced changes to everything. From the way we lived to the way, we related to each other. And so, it was only a matter of time before changes were also seen in how we relate and take care of our pets. These days, your dog could be fitted with a GPS enabled tracker to ensure you never lose him or they can regularly be sent to the vet to make sure his fur doesn’t lose its luster. However, if you are truly looking for a way to take caretaking for your pet cat or dog to the next level, the product we would be reviewing is just what you and your pet need. For most people, a typical day starts with a race to work in the morning, an attempt to juggle all your responsibilities in the afternoon and a dash back into bed in the night. And when you have a pet, you have to make time for other responsibilities like regular walks, scheduled trips to the vet and most importantly feeding your pet. However, with the tediousness of the day to day aspects of life, it is no wonder owners sometimes forget to feed their pets. The Petnet Smartfeeder is an automatic feeder that has made it easier for you to feed your pet by leveraging upon latest technologies like Amazon’s Echo and Nest home camera. 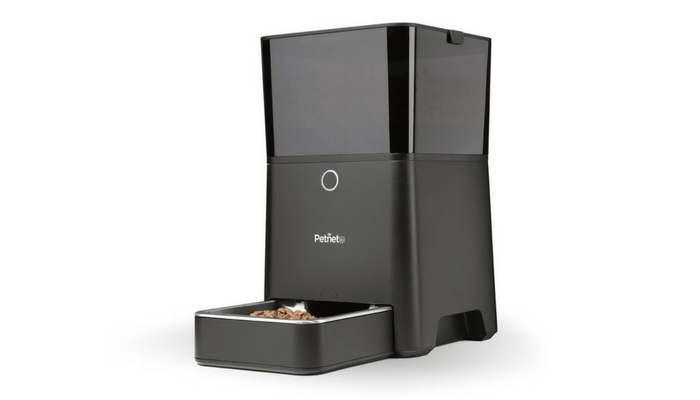 The Petnet Smartfeeder is a black device with dimensions of 15’ x 15’ x 9’. It comes with a rechargeable battery, and a USB that is chew resistant and the U.S approved A/C adapter. The gadget can store between 5–7 lbs. of dry pet food in its inbuilt hopper and it dispenses food in 1/16–11/2 cups. The great thing about Petnet is the wide range of support it allows you to have. For example, upon downloading the mobile application, you can link your Nest’s home camera to the device to allow you have real-time snapshots of your pet. You can also take advantage of its support for Amazon’s Echo and use Alexa to dispense food for your pet by just speaking to it. It comes with a year’s warranty and life support for the duration of the product. The company is currently backed by a series of industry renowned investors, and they have appeared in some of the leading news sites like Verge, business wire, Techcrunch amongst others. 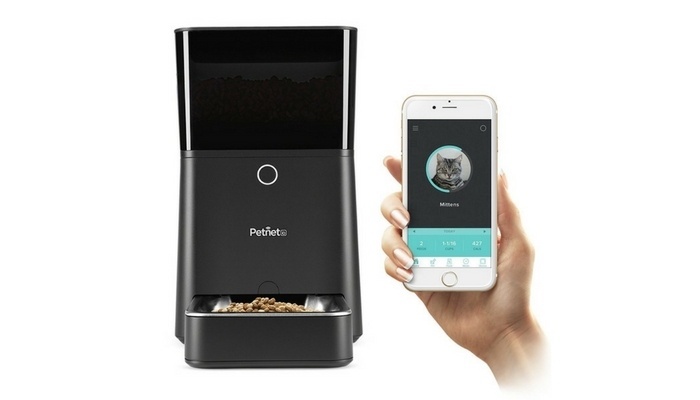 The Petnet Smartfeeder is the first product shipped out publicly from the company. It was followed by Petnet’s Smart bowl which is a wi-fi enabled bowl to help you feed your pets with the right quantity. Petnet is also working on a smart shop. According to their press release, it is a fully automated shop that uses information about your pet to provide top of the line meals and supplements to aid the growth and wellbeing of your pet. Setting up the Smartfeeder is done easily. All you need to do is to download the proper application depending on the kind of device you use, connect the device to electricity and to your Wi-Fi and put in your pet’s desired meal. The device is powered wholly by the mobile application as you use it to dictate everything your pets need. Since the Smartfeeder is not small by any standards, it must be located on the floor next to an outlet to avoid wires crisscrossing. It is not advisable to use the device to feed your pet outside. For people with different pets, chances are you may need to procure an extra feeder in order to properly configure the settings for each animal. When setting up the feeder, you will need to configure the amount of food you want to be dispensed per time. However, should you have more than one dog or cat, you should be able to work with one feeder. The mobile application allows you to keep track of every feeding it dispenses. There are also options for unscheduled meals. To do this, you can either send it through the application or simply push the round nob located in front of the feeder. Petnet went the extra mile with its feeder as it allows for a wide range of connections and integrations in order to make its experience even smoother. At the moment, your feeder is equipped to run with any Alexa enabled device like the Amazon Echo and any of Nest’s products. While you may think these integrations are not of any value, working with the nest camera helps you see your pet from anywhere you are in the world and the voice command Alexa offers allows you to simply speak to get your pet fed. Petnet is currently working on a second version of the feeder, and it promises to have support for Google Home. 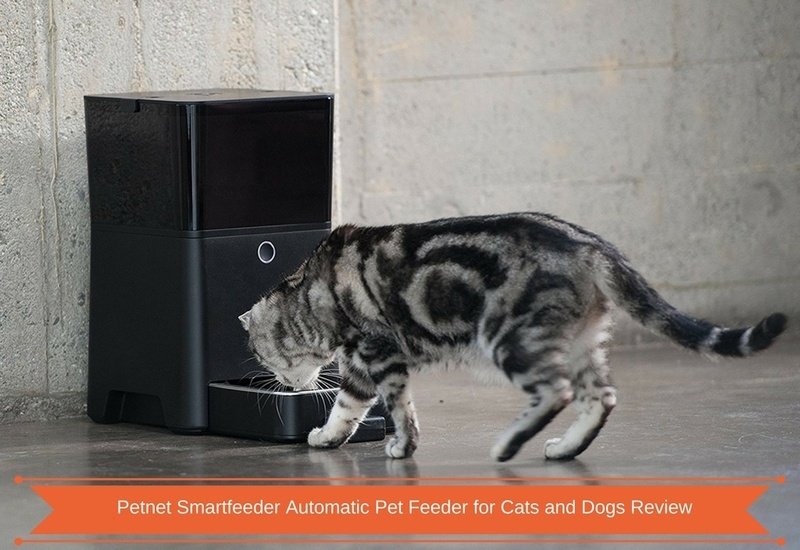 Petnet’s smart feeder is a slick and elegantly designed machine that works. Unlike other products on the market, it is moderately priced, and it offers peace of mind that is not easily found when dealing with other products in the same category it plays in.